People in politics like to be in politics. They like to talk, they like to be seen, they like to hang out with people who can give them money, and then, hopefully, they like, just as much and more, to do what they are elected to do. Talking about his relationship, he is a married man. He got married to Anne Gust (June 18, 2005), who is an American business, the current First Lady of the State of California. They are living a happy life together with no sign of divorce and other marital affairs rumors. 1 Who is Jerry Brown? Jerry is an American politician. 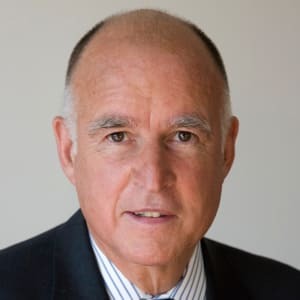 He is the 34th and 39th Governor of California and he is serving currently from 2011. He is also one of the youngest California governors in 111 years. Jerry was born in San Francisco, California, the United States on April 7, 1938. Similarly, he is also known as Edmund Gerald ‘Jerry’ Brown Jr., Edmund Gerald Brown Jr. He was born to parents, Pat Brown(father) and Bernice Layne Brown(mother). His father was a 32nd Governor of California. He has three siblings namely Kathleen Brown, Cynthia Arden Brown, and Barbara Layne Brown. He belongs to American nationality and English ethnicity. His birth sign is Aries. Talking about his education, firstly, he attended St. Ignatius High School, secondly, he attended Santa Clara University. Then, he attended the University of California. Lastly, he attended Yale Law School. Talking about his profession, he was elected California Secretary of State in 1970 and held office from January 4, 1971, to January 6, 1975. Similarly, he also won cases arguing against ‘Mobil’, ‘Gulf Oil’, ‘International Telephone and Telegraph’ and ‘Standard Oil of California’ in the California Supreme Court. He focussed on fiscal restraint that led the state to achieve one of the highest budget surpluses of around $5 billion in its history. During 1980, he was unsuccessful in his second bid for the Democratic presidential nomination. During 1995 he began hosting a daily radio show in the local Pacifica Radio station, KPFA-FM, in Berkeley. Eventually, he left the ‘Democratic Party’ and contested as an independent candidate and beat 9 other candidates securing 59 % votes to become the 47th Mayor of Oakland on January 4, 1999. There is no information regarding his salary. But he has an estimated net worth of $ 4 million. There are no such rumors and controversy regarding his personal and professional life. He is far from rumors and controversy. Talking about his body measurements, Jerry has a height of 5 feet 10 inches. Additionally, he weighs is unknown. Furthermore, his hair color is grey and his eye color is green in color. He is active on Twitter rather than on Facebook and Instagram. He has 1.1M followers on Twitter. But he doesn’t seem to be active on Facebook and Instagram. John Calipari-a great basketball coach in the making, his family ties and his controversies: Read about all here!